First off, I LOVE my 2004 Subaru WRX STi! In it’s day it was one of the best bang-for-the-buck cars sold. In my opinion, I think it actually was number 1. I like the other incarnations of it over the years, but each year they add a little bit of weight and make it more “grown up” with extra frills and sound deadening that the original STi (here in the states) did not have. The little added horsepower has done nothing to make the car better. The car handles worse than it did. 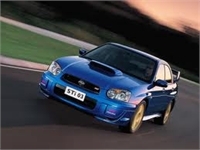 I saw the new 2011 STi it in a recent comparison in a well-known car magazine and it did so bad that I was shocked. It should have been number 1 in its respective class. The car is supposed to basically be a street-legal race car. That means that it is not for everyone, and that if the ride is too rough, you are too old. 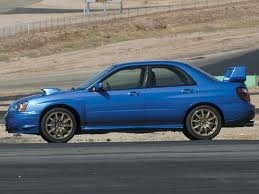 I can tell you I will enjoy my rough-riding great handling 04 STi well into my old age. The 2004 WRX STi had 300hp and 300 lb.ft. or torque from its boxer 4-cylinder engine. The car takes off from a stop like a mule and pulls hard well over 140 mph until it stops at a speed limiting 153mph (according to the speedometer). My car is tuned and goes faster and is quicker. The cars are a little expensive to tune and make faster, but it is well worth it. The car weighs 3,263 from the factory and feels lighter. In the end, I think Fuji Heavy Industries and Subaru need to go back to the earlier STi days and make the car lighter and with more horsepower. Would anyone like to see a 400hp 400 lb.ft. of torque 2.5 Liter boxer engine STi? I would. Even better, maybe a turboed version of the newer 6-cylinder boxer engine? I think 400-500hp and the same torque with the 6-cylinder engine would be awesome! Throw in a stronger transmission capable of high-rpm launches, wider tires, 18inch wheels, and 3,000lbs. or lighter, and you have an awesome car with people willing to pay a premium for it. What do you think? Leave me comments and let me know. Thanks for reading!